If you've ever walked past a cattle grid in the country, you've probably figured out that it's easy to get your feet stuck in one if you make the wrong move. Unfortunately for this kangaroo, it's not only got stuck in one, but it went in head first. Luckily, an unnamed man came along to valiantly rescue this poor little roo from its predicament. It was all captured in a video uploaded by YouTube user. 17, and the description states that it all went down near the Flinders Ranges in South Australia. 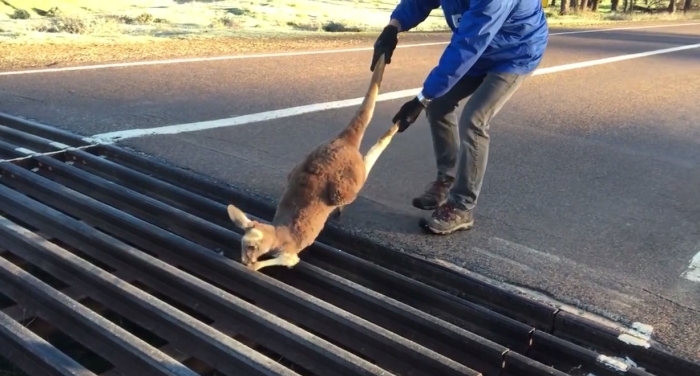 A little pushing and pulling resulted in the kangaroo's freedom. The little fella hopped off into the distance without so much as a nod to the rescuer. Sometimes being a hero is a thankless job. With one final pull, the man manages to wrangle the kangaroo's head out from between the bars. "Ho!" the man yells when it finally comes free. The children both cheer with joy as the kangaroo makes a quick getaway, one of them wishing it "a good life" as it bounds off into the distance. Responses to "Man Takes On The Heroic Task Of Rescuing A Kangaroo From A Cattle Grid"